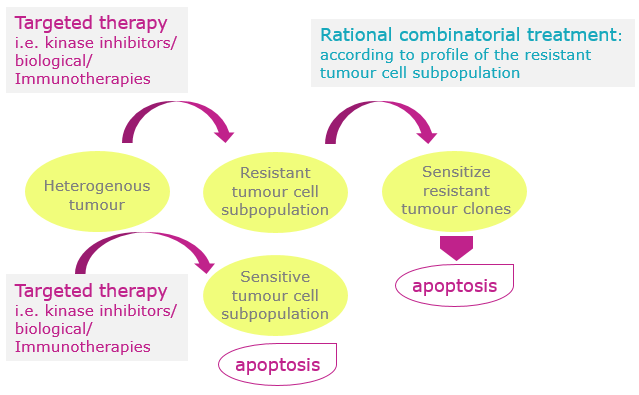 Development of new therapeutic concepts based on individual molecular, imaging and immunological characteristics with the goal to tailor tumor therapy on an individual basis. This includes all available treatments including conventional chemotherapy, signal inhibitors, antibodies, precision radiotherapy, immunological approaches as well as combinations. Implementation of patient oriented high-throughput diagnostics including the possibility to sequence the tumor exome and/or genome as well as to characterize the immune system of each ACCC patient. Sequencing and bioinformatic platforms at the NHRF and the other participating research institutions as well as from the cooperation partners at the DKFZ will be used or established. Positioning the ACCC as a national center of early cancer detection, prevention and translational research. Stronger integration of basic oncological research into translational concepts, through interaction between the NHRF and the oncological clinics involved as well as with the cooperation partners of the DKFZ and the NCT Heidelberg. Cooperations with the DKFZ and the NCT Heidelberg will be embedded in joint projects (see Core Activities). Recruitment of researchers and clinicians to implement joint research projects between the clinical and laboratory groups. Training of research and medical personnel in new technologies and processes required for the implementation of the ACCC. Purchasing supplementary equipment to fulfill the goals. Establishment of multidisciplinary tumor boards with the goal to develop an individualized therapeutic concept for each ACCC patient. Development of translational and clinical research structures including an ACCC clinical trial center, an ACCC cancer registry and ACCC biobanks. Establishment of a Cancer Information Service.